The presidency has explained why Service Chiefs ‘partly’ graced the official opening of President Muhammadu Buhari campaign flag-off. The campaign team tagged ‘2019 Next Level’ was launched on Sunday and had Service Chiefs of the nation in attendance. Some service chiefs, including the Chief of Defence Staff, Gen. Gabriel Olonisakin; the Chief of Air Staff, Air Marshal Abubakar Sadiq; and Chief of the Naval Staff, Vice Admiral Ibok-Ete, were reportedly among those present at the launch. 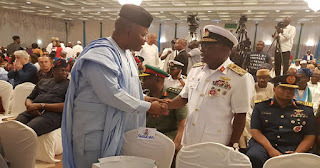 A Senator of the ruling All Progressive Congress (APC), Godswill Akpabio was seen in a trending picture exchanging pleasantries with one of the service chiefs at the event. Their presence at the occasion has generated worries over the non-partisan stand they are expected to maintain as the general election draws near. On social media, the development has generated reactions which mostly condemned the presence of the service chiefs at the event. Explaining what brought the service chiefs to the occasion, the Presidency said the attendees mistook the occasion of being a non-political one as they left on realisation that it was not. Garba Shehu, the president’s spokesman stated this on Monday while weighing in on the controversy. He also said the development was unnecessary. “They were mistaken in their assumption that this was a non-political event, to showcase the achievements of the administration, the success of which they are a part,” Mr Shehu said on his twitter handle. “Hardly were they seated than did the Minister of Defence, Brigadier General Mansur Dan AlI (Rtd) ask them to leave as this was a political gathering. “They quickly left, even before the arrival of the President and for the event to get under way. The fuss over this in therefore absolutely unnecessary,” he added.